I like to think my life isn’t falling apart. But it kind of is. Okay, so maybe I’m being a little over dramatic. Nonetheless, I’ve got some seismic plate shifting going on. For starters there is the whole single thing. And a few days ago I put in my notice at the Goodwill, after my boss went psycho crazy on me (and like everyone one else. Lady, I get it. You’re menopausal, but that isn’t an excuse to vent your anger and hot flashes. I don’t get snippy when I’m PMSing…end of rant). I’ve wanted to quit for a long time, but I was kind of waiting to have another job lined up, but after the altercation—and good phone call with my mom—I decided it was time to say goodbye. I then proceeded to go home and down an entire bottle of Rose, while watching some Netflix. Note to all: if you feel the need to have one of those nights I like to call “Wine Whines” go with Rose. At 5% alcohol content finishing the whole bottle will leave you very tipsy, but not sufficiently plastered like stronger reds.Although I have no desire to drink that much again for a long time, I definitely needed that night. I’ve spent the past 17 months at Goodwill, so it’s a bit weird to not have to tie on my apron, and I’m definitely going to miss my 30% discount, but enough is enough. It was causing wayyyy to much unnecessary stress in my life. I still have my second job until the end of the month, and I have enough money for two months rent, but my days are basically going from usually having to work 6 days a week to having all this free time. Eerie. Of course I’m working on finding a job, but I wouldn’t say I’m running out the door. At least not until next week. I’m kind of looking forward to the break, of being able to relax on my porch, sleep in, and go to yoga when I want. OOh timeeeee is on my sideeee, yes it is. I admit, it’s a little scary, but so was working at the GW, walking on eggshells, waiting for my boss to lash out at someone. No thank you! But back to the porch: that’s just what I did all stinking day. 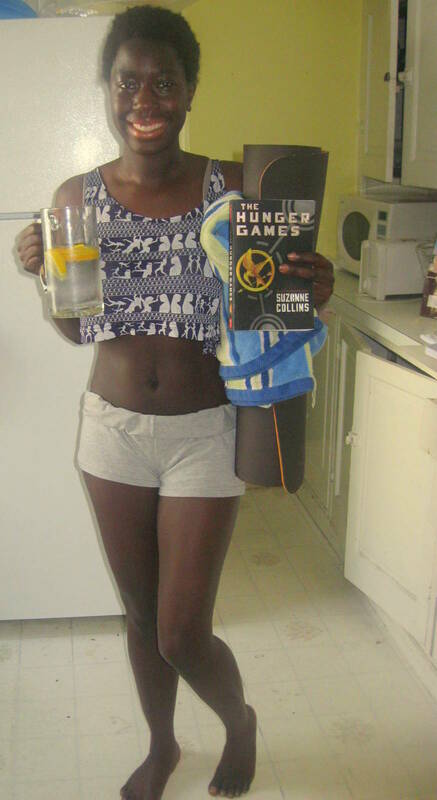 I poured myself a glass of water with some lemon slices, donned my belly baring crop top, grabbed a blanket, my least favorite yoga mat for cushion, and parked my cheekies outside all day to read The Hunger Games. I know, I’m a little behind the times…. Anyway, I’m excited to say I finished the entire book in one afternoon, got a little teary eyed at a particular scene (hint: it involves a net, Mockingjay birds, and a spear), and got transported into a world of starvation, injuries, and budding love. I’d say that was a success.